You will need Dart and Flutter set up on your system. 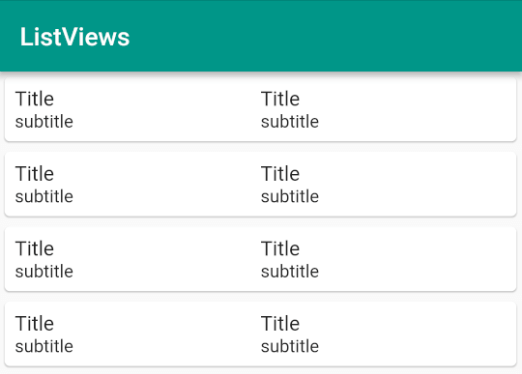 If you have done any Android or iOS development before, you are going to love how easy it is to make ListViews in Flutter. In this article we will use simple examples to look at all of the common use cases for making them. Consider this page a reference. Bookmark it and come back here to copy-and-paste the code snippets as starters in your own projects. 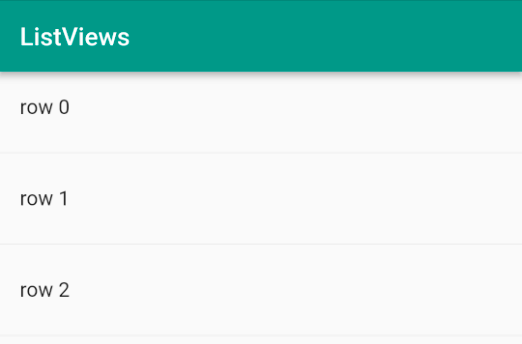 First we will look at the main types of ListViews that are available. After that I'll show you how to style the items. Finally I'll cover how to make changes by adding and removing items in the list. I'm using Android Studio with Flutter 1.0 for this article, but you should be fine if you are using another IDE. Start a new Flutter project. I'm calling mine flutter_listview. Note the _myListView() function at the end. You will be replacing this with the code in the examples below. If you have a short list of items that don't change, then you can use the default ListView constructor to make it. This is useful for making something like a settings menu page. Look back at the code. The children of the ListView were ListTiles. A ListTile is a special widget that is preconfigured to handle the most common layouts that you would want in a ListView. Our list above only included a title, but a ListTile can also include subtitles, icons, and images. We will come back to ListTiles when we look at styling below. If you want to add dividers between the rows then use the ListTile.divideTiles constructor. 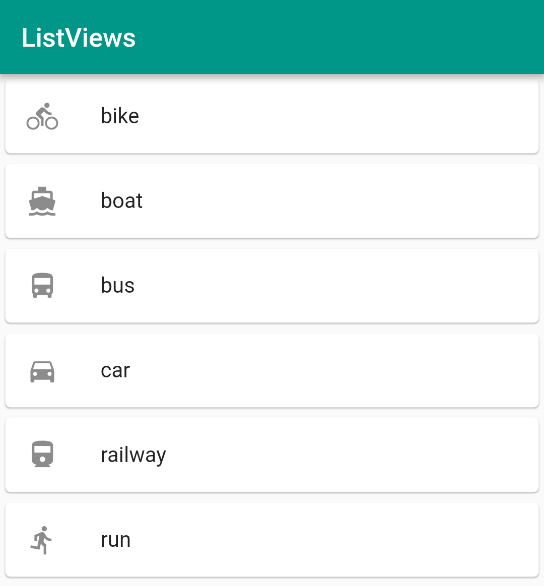 All of the elements of a static ListView get created at once. This is fine for a short list but not for a long list. You can make a dynamically created ListView by using the ListView.builder() constructor. This will create the ListView items only when they need to be displayed on the screen. 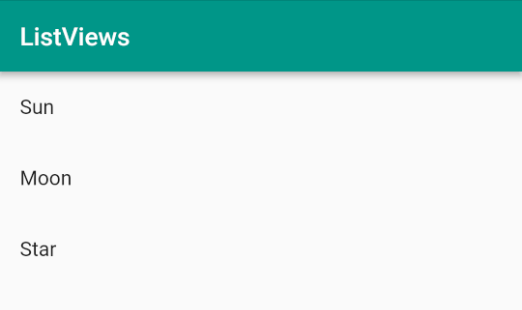 It works like an Android RecyclerView but is a lot easier to set up. Look back at the code. I provided an itemCount that tells the ListView how many list items there will be. I also provided an itemBuilder function that dynamically builds each ListTile as it comes into view. The function provides the BuildContext as the context parameter and the item position as the index parameter. The index makes it convenient to get the data items from the list of European country names that we are using as the backing data. I remember struggling trying to make infinite lists in the past with Android or iOS. Flutter makes it simple, though. Just remove the itemCount parameter from the ListView.builder constructor. Since Europe doesn't have an infinite number of countries, we'll change the ListTile to display the row index. You can scroll all day and you'll never get to the end. That was way too easy. I love it. If you want to add dividers between tiles in a dynamic ListView, you can use the ListView.separated constructor. Again, you have to look carefully to see the dividers. You can add arguments to Divider() if you want to change the line height or color. It's also really easy to make a horizontally scrolling ListView. All you have to do is specify the scrollDirection as horizontal. Since ListTiles aren't designed for horizontal ListViews, we will use a simple custom layout. We’ve covered the main ListView types above, but they were pretty plain. Flutter offers a lot of options to make them more beautiful. The Flutter team designed the ListTile widget to handle the normal content that you would want in a list. This means that most of the time there is no need to define a custom layout. You can just use the default ListTile for each item in the list. When we made a ListView in the example above we only used the title option. But we can also show subtitles, images, and icons. The leading is for adding an icon or image at the start of the ListTile. You can also add an icon at the end if you specify the trailing attribute. Instead of icons, we can also use images. The recommended image option is to use a CircleAvatar widget. It won’t work yet because we need to add the images. If you haven't done this before and are running into problems, you can check out this post for more help. Before we leave ListTile customization, one last thing we should cover is subtitles. Edit the code above to add a subtitle argument. As you can see, the subtitle adds a line of smaller text below the title. Cards are a great way to make your list look classy. All you have to do is wrap your ListTile with a Card widget. Play around with the Card attributes. You can change the shadow by adjusting the elevation. Also try changing the shape and margin. If a ListTile doesn't fit your needs, you are free to design your own tile. 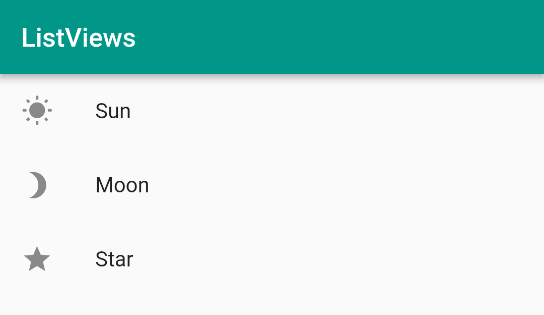 Remember, all that ListView wants is a list of widgets. Any widget is fine. I recently worked on an app that required multiple columns in each list item. Here is a simplified example. If you are using a ListTile, all you have to do to respond to user touch is to add an onTap or onLongTouch callback. In a more realistic situation we would probably navigate to a new screen (see Responding to user input) or show a detail view on a tablet. Of course there are other options, too. We could wrap each column separately in an InkWell or add a button or some other gesture detector. It is pretty easy to update the items in a normal ListView. All you have to do is use a Stateful widget and call setState() whenever the row data changes. When you tap an item it adds a "Planet" item at that index. When you long press an item, it removes it. The problem with this method, though, is that the changes are abrupt. 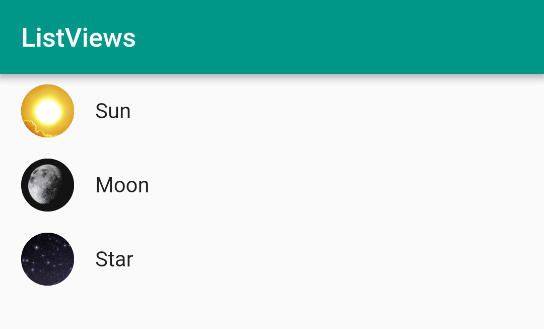 To make adding and deleting rows look nicer, Flutter has an AnimatedList widget. // while they are being animated. // an additional animation parameter. // share it with the _removeSingleItem() method. // This is the animated row with the Card. // Add the item to the data list. // Add the item visually to the AnimatedList. // Remove item from data list but keep copy to give to the animation. // animating away. The item is already gone from the data list. // Remove the item visually from the AnimatedList. An AnimatedList needs a GlobalKey that keeps track of the widgets while they are being animated. Every time you make a change to the list, you need to update both the backing data list and the global key. Our row widgets are stateless, but if your rows have state, then you will need a key for them, too. This helps the system know when a change actually happens. See this video from the Flutter team for more about that. I used a SizedTransition as the animation here, but see the documentation for other options. We have taken a full tour of ListViews. You should have a solid understanding now of how to implement the vast majority of use cases that you will encounter. Check out the Further Study section below to see ListViews being used in more advanced situations.